Two expansion teams, the Minnesota Wild and the Columbus Blue Jackets, joined the league at the beginning of the season, increasing the number of NHL teams to 30. The Blue Jackets would join the Central Division, while the Wild would join the Northwest Division. This divisional alignment would remain static until the 2013–14 season. This was the first time the NHL would have a team in Minnesota since the Minnesota North Stars moved to Dallas, Texas in 1993, and the first time for Ohio since the Cleveland Barons merged with the North Stars in 1978. The Dallas Stars played their final season at the Reunion Arena before moving to the American Airlines Center in 2001. On December 27, 2000, Mario Lemieux returned from his three-and-a-half-year retirement and, in a game nationally televised on Hockey Night in Canada, registered his first assist 33 seconds into the game against the Toronto Maple Leafs. He went on to add a goal and finish with three points, solidifying his return and bringing a struggling Jaromir Jagr back to his elite status, who went on to win his fourth straight Art Ross Trophy, narrowly surpassing Joe Sakic. Despite playing in only 43 games in 2000–01, Lemieux scored 76 points to finish 26th in scoring, finishing the season with the highest points-per-game average that season among NHL players. Lemieux was one of the three finalists for the Hart Memorial Trophy and Lester B. Pearson Award. The record for most shutouts in a season (set at 160 in 1997–98 and equalled in 1998–99) was eclipsed, as 186 shutouts were recorded. The 2001 Playoffs saw many surprises, most notably when the upstart Los Angeles Kings beat the Detroit Red Wings. The Washington Capitals, another Stanley Cup favorite, were knocked out in the first round by their longtime rivals, the Pittsburgh Penguins. The darkhorse Penguins (aided by Mario Lemieux's return) made it all the way to the Eastern Conference Final, where they were dispatched in five games by the New Jersey Devils. The presentation ceremonies were held in Toronto. Jesse Belanger New York Islanders 1-time Stanley Cup champion with the Montreal Canadiens. Ray Bourque Colorado Avalanche 1-time Stanley Cup champion with the Avalanche, 16-time NHL All-Star, 4-time James Norris Memorial Trophy winner, Calder Memorial Trophy winner, King Clancy Memorial Trophy winner, Lester Patrick Trophy winner, over 1600 games played. Paul Coffey Boston Bruins 4-time Stanley Cup champion with the Edmonton Oilers and Pittsburgh Penguins, 14-time NHL All-Star, 3-time James Norris Memorial Trophy winner, over 1400 games played. Rene Corbet Pittsburgh Penguins 1-time Stanley Cup champion with the Colorado Avalanche. J. J. Daigneault Minnesota Wild 1-time Stanley Cup champion with the Montreal Canadiens. Kevin Hatcher Carolina Hurricanes 5-time NHL All-Star, over 1100 games played. Garry Galley New York Islanders 2-time NHL All-Star, over 1100 games played. Tony Granato San Jose Sharks Bill Masterton Memorial Trophy winner, 1-time NHL All-Star. Kris King Chicago Blackhawks King Clancy Memorial Trophy winner. Kirk McLean New York Rangers 2-time NHL All-Star. Joe Murphy Washington Capitals 1-time Stanley Cup champion with the Edmonton Oilers. Larry Murphy Detroit Red Wings 4-time Stanley Cup champion with the Pittsburgh Penguins and Red Wings, 3-time NHL All-Star, over 1600 games played. Ron Sutter Calgary Flames Over 1000 games played, the last active Sutter brother to play in NHL. Petr Svoboda Tampa Bay Lightning 1-time Stanley Cup champion with the Montreal Canadiens, Olympic gold medalist, over 1000 games played. ^ "1997-98 NHL Goalie Statistics". Hockey-Reference.com. ^ "1998-99 NHL Goalie Statistics". Hockey-Reference.com. ^ "2000-01 NHL Goalie Statistics". Hockey-Reference.com. ^ "2000-2001 Division Standings". NHL.com. Retrieved July 15, 2012. ^ "2000–2001 Standings by Conference". National Hockey League. Retrieved July 15, 2012. ^ "2000-2001 Conference Standings Standings - NHL.com - Standings". NHL. ^ Dinger, Ralph, ed. (2009). The National Hockey League Official Guide & Record Book/2010. Dan Diamond & Associates. p. 161. ^ "Jesse Bélanger - Bio, pictures, stats and more - Historical Website of the Montreal Canadiens". ourhistory.canadiens.com. ^ "Bourque relishes memory of winning Stanley Cup". NHL.com. ^ "Coffey gets his day as jersey officially retired" – via The Globe and Mail. ^ Wilson, Kent (6 November 2012). "Where Are They Now? – Rene Corbet". Flamesnation. ^ DOYLE, PAUL. "After Years Bouncing Around In Hockey World, Whale Coach J.J. Daigneault Finally Has Roots In State". courant.com. ^ Pelletier, Joe (24 June 2009). "Washington Capitals Legends: Kevin Hatcher". ^ August 20, Vito Pilieci Updated:; 2015 (20 August 2015). "Brewing upstart makes beer to help "Do It For Daron" mental health initiatives - Ottawa Citizen". ^ "Legends of Hockey -- NHL Player Search -- Player -- Tony Granato". 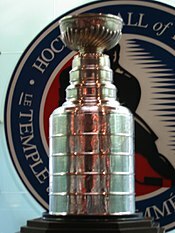 www.hhof.com. ^ December 8, CBC Sports ·; 2001. "Kris King added to NHL head office - CBC Sports". CBC. ^ Westhead, Rick (10 December 2014). "Westhead: Former players charge NHL concussion program is a "whitewash" - TSN.ca". TSN. ^ "No. 4: Murphy proved a steal for Wings in '97". NHL.com. ^ "Sutter Brothers Receive WHL Milestone Award – WHL Network". ^ "Where are they now? Petr Svoboda - Historical Website of the Montreal Canadiens". ourhistory.canadiens.com.